But I was thinking, and I have a surprise for everyone. I decided to have a second place prize as well. You all have been awesome and so supportive, I wanted everyone to win! So the second prize is a picture packet that came with the books. 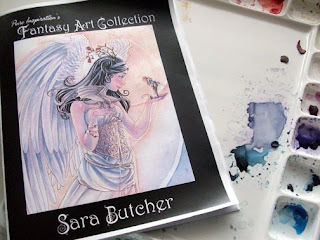 It contains all the pages in the book that show my work and statement, along with my website and the Fantasy Art Collection's website. Thank you everyone for participating in this drawing! It was SO much fun that I know for a fact I will be doing another one soon! Congratulations for the winner ! She's so lucky !